The Alfa Laval Moatti 290 filter for hydraulic control oil (HCO) has been approved by MAN Diesel & Turbo on its modern two-stroke engines following validation tests aboard three Stena Bulk IMOIIMAX vessels. The filter was approved based on the results seen on four Stena Bulk vessels, where the HCO filter's performance has exceeded all expectations. "We are extremely proud to have the Alfa Laval Moatti 290 filter validated for use with HCO systems," said Herve Gourdon, Business Manager, Filters at Alfa Laval. "This is the culmination of 10 years of intense cooperation, development and testing." Alfa Laval began discussing the filter with MAN Diesel & Turbo in 2008, when the engine manufacturer started its transition from camshafts to hydraulic control systems. The fine HCO filtration required by the engine design demanded an entirely new filter technology. Alfa Laval's prototype HCO filter, presented in 2014, spent over 24,000 hours in concept testing aboard the Suezmax crude oil tanker Stena Suède. "After almost two years of operation on Stena Suède, we tested the finalized design for 3000 hours on three other vessels," Gourdon said. "MAN Diesel & Turbo approval was issued when the first vessel passed that mark, acknowledging our filter's performance with hydraulic control oil." The Alfa Laval Moatti 290 filter is built to the most recent MAN Diesel & Turbo recommendations, which require both an automatic filter and a redundant filter with high enough efficiency to retain particles of 6 µm and below. These are incorporated into the same frame, with a specially designed changeover valve to prevent any leakage during maintenance. "Alfa Laval makes sure to stay on top of changing engine maker specifications," Gourdon said. "Our HCO filter reflects the latest developments and eliminates the need for any disposable filter." The redundant filter, which is manually cleanable, can be used not only during maintenance, but also for initial oil cleaning or when new oil is added into the system. It is not used, however, to clean the small flow of oil that provides continuous backflushing. Instead, this flow is cleaned in a diversion chamber before it is returned to the sump. "Our solution is designed so that the redundant filter is not continuously employed, for example to treat the backflush," Gourdon explained. "Rather, the redundant filter is fully separated in order to ensure it will be fully operational in the case of emergency." "Ship owners are looking for an economical long-term solution, rather than a quick fix," Gourdon said. "Disposable filter elements add up to a significant cost over time, whereas components in the Alfa Laval Moatti 290 filter can be removed for cleaning and simply put back into operation. Combined with the reliability achieved by continuous backflushing, that means a lower operating cost for the filter overall." 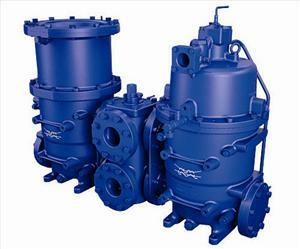 At present, the Alfa Laval Moatti 290 filter covers the vast majority of MAN Diesel & Turbo two-stroke engines, with focus on the more common mid-range sizes. Coverage for the very largest and smallest engines will follow. Those who wish to see the filter first-hand will have the opportunity at two upcoming exhibitions, Posidonia (June) and SMM (September), where it will be featured in Alfa Laval's stand. "Having both MAN Diesel & Turbo approval and extremely successful results to present, we're looking forward to discussing the Alfa Laval Moatti 290 filter directly with customers," Gourdon said.